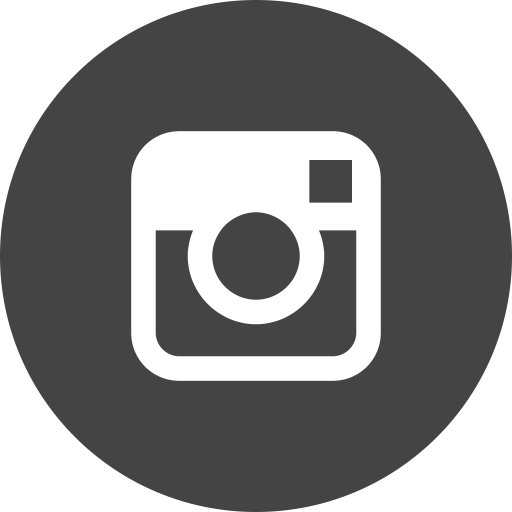 Beginning in 1925, the Ford Motor Company, by then well known for successfully mass producing reliable inexpensive cars, entered into the uncertain and risky realm of the aircraft design and production business. 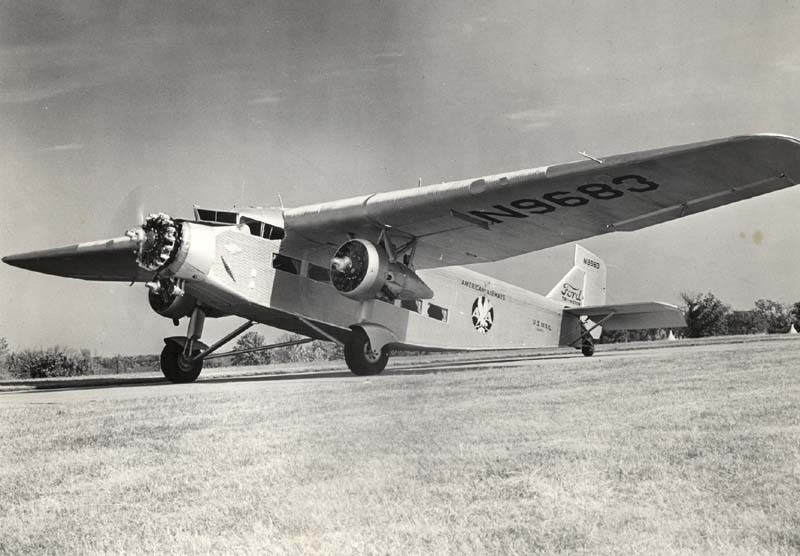 The Ford Trimotor, or “Tin Goose,” as it was affectionately nicknamed, was undeniably the best product to come out of the endeavor. More than any other aircraft up to that time, the Trimotor had a profound effect on the early advancement of commercial aviation. On the urging of his son Edsel, Henry Ford, along with a group of investors, purchased the Stout Aircraft Company in 1925, and began developing a new commercial airliner design; one they hoped would ultimately revolutionize the industry. 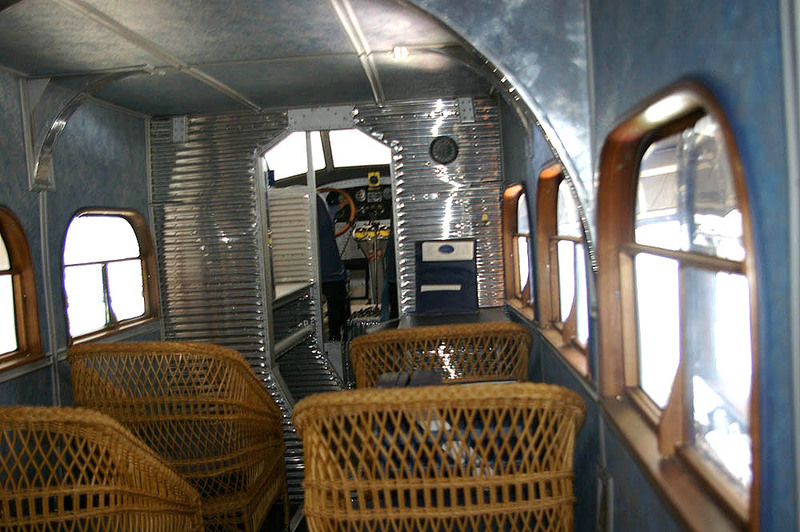 During the 1920s Stout had been experimenting with airplanes made of corrugated aluminum, a relatively new material at the time, which resulted in an extremely sturdy fuselage. Ford ultimately went with a three engine design because it was considered the safest. If one engine failed, the other two had enough power to fly to safety. Many airliners of the 1920s had three motors. Of these Ford was particularly impressed with the design of the plywood and cloth Fokker F. VII Trimotor, the winner of Ford’s own cross-country Reliability Air Tour in 1925. As a result, Ford’s design team reengineered the earlier Stout designs and emerged with the all aluminum 4-AT and 5-AT Trimotors. The 4-AT was equipped with three Wright Whirlwind engines, while the 5-AT had the more powerful 420 horsepower Pratt and Whitney Wasp engines. Production of the first 4-AT Trimotors began in 1926. By the end of production in 1933, 199 were produced. In the 1920s commercial aviation in the United States was in its infancy, and still considered quite dangerous. 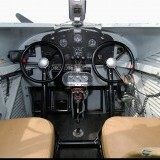 Yet the Ford Trimotor proved that flying was a fast, and most importantly, safe means of long distance transportation. Ford used his name, and an extensive publicity campaign focused on the safety of the Trimotor, to gain the trust of the public. In service the aircraft proved to be extremely reliable and easy to maintain. Moreover, it compiled one the best safety records in the industry. Although somewhat noisy compared to later commercial aircraft, at the time it offered passengers one of the most comfortable flying options available, with all wood interiors, cane-back seats, plenty of windows and a lavatory (the waist was expelled through a hole in the bottom of the aircraft). Thousands of people who had never flown before were suddenly willing to venture aboard the new Trimotors, and airline companies across the country quickly began adding them to their fleets. By 1929 Transcontinental Air Transport (later TWA) used the Trimotor to inaugurate the nation’s first regular coast to coast air service. The Military also purchased Trimotors to use as transport aircraft. In 1929 Commander Richard E. Byrd, convinced that the aircraft was one of the most reliable available, successfully attempted the first flyover of the South Pole in a modified 4-AT, the Floyd Bennett. The Museum’s Ford Trimotor has a very extensive provenance that illustrates well the great versatility and durability of the aircraft. 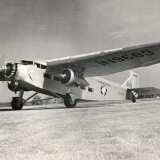 It was the eleventh 5-AT to come out of Ford’s Dearborn Michigan plant, and was first purchased by Pan American Airlines in December of 1928 for their popular Miami to Cuba route. Four months later it was transferred to Compañía Cubana de Aviación, a Pan American affiliate, to the fly the Brownsville to Mexico City route. After five years with the company it was sold to TACA Nicaragua and used as a cargo carrier. By 1945 the craft was with Compañia Dominicana. From there title went to a Burbank California company, and then to the San Luis Mining Company of San Francisco and Durango, Mexico, where it was used for 16 years to carry mail, freight and passengers to the company’s mines in Mexico. In 1966 it was sold to Arizona Automotive of Tucson, and several years later, title went to Island Airlines of Port Clinton, Ohio. In 1968 the Trimotor became an exhibition in the air when it was restored to its original Pan American scheme by Wheels and Wings Museum of Santee, South Carolina. Eight years later it was purchased by Scenic Airlines of Las Vegas for air tours over the Grand Canyon and the Las Vegas Strip. While with Scenic Airlines it was blown from its tie-downs by a strong wind storm and ended up in a drainage ditch twisted and mangled, and seemingly damaged beyond repair. By that time the Trimotor had logged 24,043 hours of flight time. The Trimotor 5-AT-11 was then donated by Scenic Airlines to the San Diego Air & Space Museum in August of 1983. It was stored at North Island Naval Air Station until late 1984, when it was moved to the basement of the Ford Building for a long and arduous restoration process. Under the leadership of Tim Cunningham, the restoration volunteers spent nearly 15 years, and tens of thousands of hours, painstakingly remanufacturing and crafting every detail of the plane to assure a historically accurate restoration, one that would represent the original Trimotor of 1928, when it was owned by Pan American Airlines. 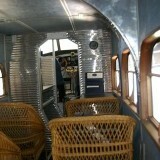 The corrugated aluminum panels were formed from the original Ford Trimotor dies. 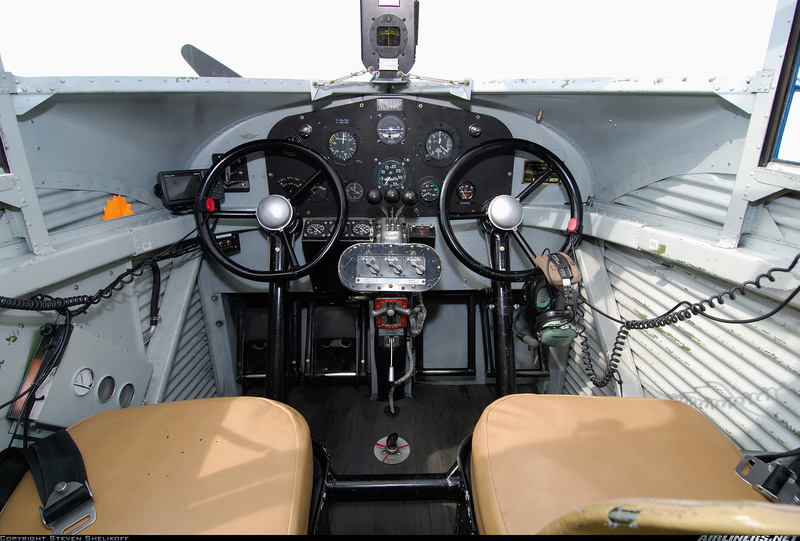 The cockpit and the beautiful all-wood interior were replicated in nearly every detail, including exact reproductions of the passenger seats, paneling, window frames and lavatory. The three Pratt and Whitney Wasp engines were rebuilt and put in operating condition, with their original cowlings and instrumentation. Today you can see the Ford Trimotor 5-AT-11 on exhibition in the Pavilion of Flight of the Ford Building, next to the museum’s two 1930s V-8 Ford cars, as a testament to Ford’s major role in the development of transportation in the 20th Century, both on the ground and in the air.